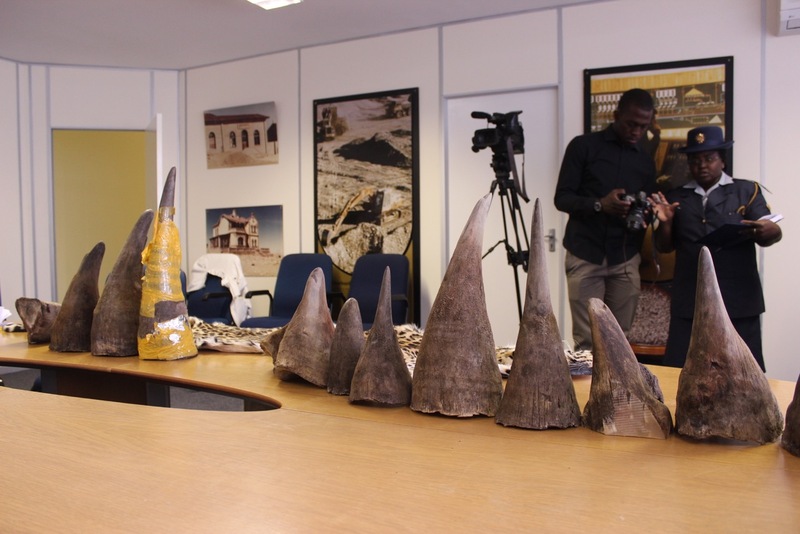 A Chinese syndicate caught with 14 rhino horns in their luggage had carefully planned the operation, scouting Namibia first before recruiting a low-level “mule” in China who was to take the rap if they were to be caught, Chief Inspector Barry de Klerk of the Namibian Police’s Protected Resource Unit (PRU) told the Windhoek Regional Court this week. Before proceedings were postponed by a month at the request of the accused’s lawyer, Orben Sibeya, the court was treated to a revealing look into the inner workings of a Chinese syndicate, one of five believed to be active in Namibia. Testifying in the trial of Li Xiaoling (31), Li Zhibing (54), Pu Xuexin (50) and Hui Wang (40), De Klerk told magistrate Alexis Diergaardt he was offered a bribe by another party to drop the case against Hui, who was arrested more than a year after the first three were detained at the Windhoek airport on March 24 2014 with 14 rhino horns and a leopard skin in two suitcases. The attempted bribery incident was still under investigation and he therefore could not comment on it, De Klerk said afterwards. Leading the court through their investigation, De Klerk testified that the Chinese suspects’ behaviour showed sophisticated planning, dating back to November 2013 when Li Xiaoling and Pu Xuexin had first visited Namibia briefly, posing as tourists. This he believed was purely a scouting trip to check out both the merchandise and best possible smuggling routes out of Namibia, a typical methdology deployed by organised crime syndicates, De Klerk testified. Around the same time, either Hui or Pu had recruited Li Zhibing from their common home village in Jiangsu Province in China. Li Zhibing was the oldest but visibly most junior member of their syndicate, judging by the fact that his passport was issued only in November 2013. “It was noticeable that the only time he used his passport was for this [March 2014] trip,” De Klerk said. 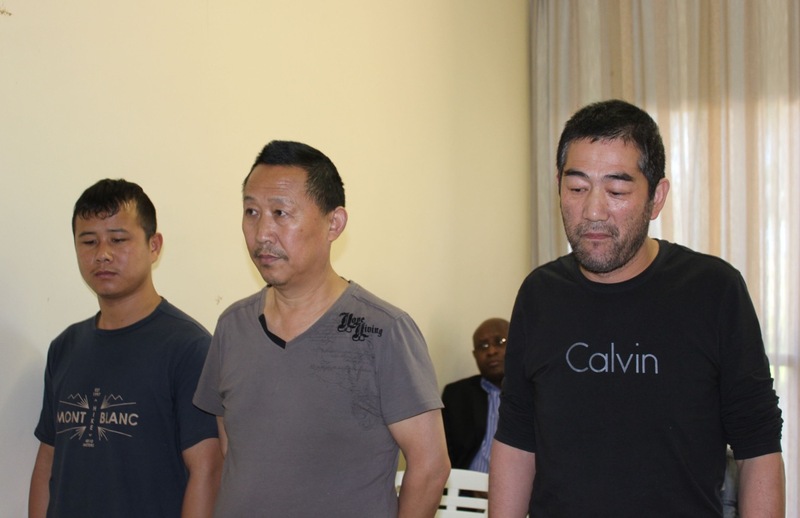 A reconstruction via the visas and entry stamps in Li, Li and Pu’s passports of their journey to Zambia and Namibia showed that the trio had all applied for 90-day tourist visas from the Zambian High Commission in Beijing in January 2014, he testified. The syndicate then waited two months before moving into action: Li Xiaoling travelled to Lusaka a week prior to Pu Xuexin and Li Zhibing boarding the flight for Lusaka via Johannesburg on March 9 2014. Once they landed in Lusaka, the trio applied for tourist visas from the Namibian High Commission in Lusaka the next day and departed for the Namibian border town of Katima Muilo on March 12 by bus. There they spent one night with friends before travelling to Otjiwarongo, where they spent 10 days with another friend whom the police believed was none other than Hui Wang, De Klerk testified. 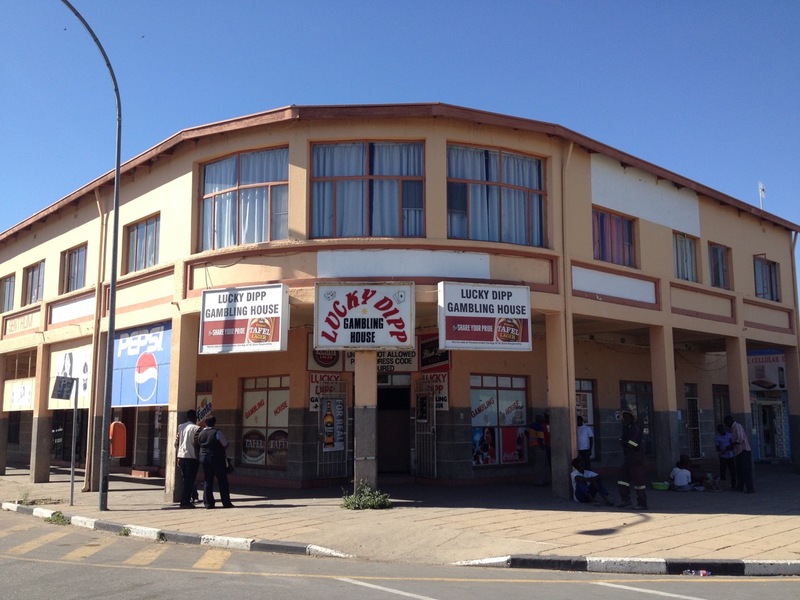 Hui, who owns two shops in Otjiwarongo, had disappeared from Namibia before the police could identify him from the CCTV footage and was only arrested on May 18 this year, after the PRU got word that he was back in Namibia. Hui’s Chinese travel records, independently obtained by Oxpeckers, however showed that he had left Namibia for China on August 7 2013 – and never officially re-entered Namibia since then. The same records showed that he had made four trips from Shanghai to Lusaka between August 7 2013 and April 23 2015. Hui likely also entered Namibia via Katima Mulilo, the same route followed by Li, Li and Pu, before his arrest at the hotel’s casino on May 18 by a team of detectives led by De Klerk. Footage from four different security cameras at the Windhoek Country Club and Casino screened in court showed the four men arriving, with Hui leading the way to two rooms he had booked on Sunday 23 March 2014. Hui then left shortly afterwards, returning five minutes later with a tan suitcase which he left with Li and Li in their room. Hui and Pu then left the hotel for about an hour while the two Lis remained in their room throughout, with Li Xiaoling only emerging briefly to take a “selfie” in the corridor. Upon Hui and Pu’s return, the Lis were seen exiting the hotel and returning shortly afterwards from the parking lot with a blue suitcase which they took to Hui and Pu’s room. The tan suitcase was then also moved to the Lis’ room, and after 20 minutes, both suitcases – now visibly heavier – were returned to the Lis’ room. Hui ordered room service for them, and he and Pu disappeared – presumably into the casino, as they could not be seen leaving the hotel – and returning only around 01h26. All four men left the hotel just before 05h00 the next morning, with the Lis pulling the tan and blue suitcases. The tan suitcase contained 14 rhino horns and the blue suitcase contained four large rhino horns and an illegal leopard skin when confiscated from them at the airport two hours later, the court was informed during previous proceedings. De Klerk said when he interrogated the trio later that Monday at the PRU offices, Pu addressed the younger Li in a manner that made it clear who the junior was, “… with Li being visibly subjugated by Pu”. Hui was clearly the kingpin, he said, as he had booked and paid for the hotel rooms and the three other men’s one-way tickets back to Shanghai in cash. Pu appeared to be the “manager” of the three-man smuggling team, De Klerk told the court. Li Zhibing attempted to take all guilt upon himself in a plea explanation rejected by the state when the case commenced in June. This atttempt to take the fall for the others was a typical sign of an organised crime syndicate where the most junior member took the rap for all the other members, De Klerk said.